Beyond the Boundary, as known as Kyoukai no Kanata, is a light novel series that received an honorable mention in the 2011 Kyoto Animation Award Competition. Kyoto Animation later adapted the series into an anime series, which aired between October and December 2013. 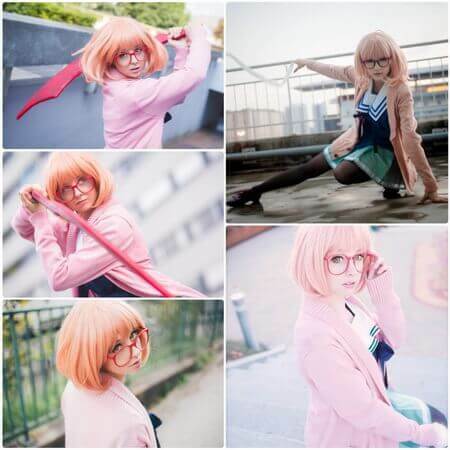 This article will be a Mirai Kuriyama cosplay guide. The series tells the story of two high school students Akihito Kanbara, who is an immortal half-yonmu and half-human, and Mirai Kuriyama, a Spirit World Warrior. As a Spirit World Warrior, Mirai is a specialist who protects humans from yonmu, which is a supernatural creature. The story begins when Akihito, who is the child of a human and yonmu, stops Mirai from committing suicide. Akihito is the main protagonist of the series while Mirai is one of the main characters. Dressing up as Mirai is not that complicated to achieve, considering she has been seen to wear mostly the same outfit throughout the series. Mirai Kuriyama is a 1st-year high school student who also comes from a bloodline of Spirit World Warriors that can manipulate blood. This ability, though, is also the reason why other Spirit World Warrior clans consider her as an outcast, as blood manipulation is a heretical ability. This Mirai cosplay set will come with the full costume, which consists of her school uniform. It’s a dark blue sailor-type uniform with black buttons, a white collar, and a thin black scarf tied like a ribbon. It also has a light blue skirt, knee-length black socks, and school shoes. The cosplay set also comes with a pink cardigan that Mirai wear, a thick-rimmed round red glasses, and a short light orange wig. 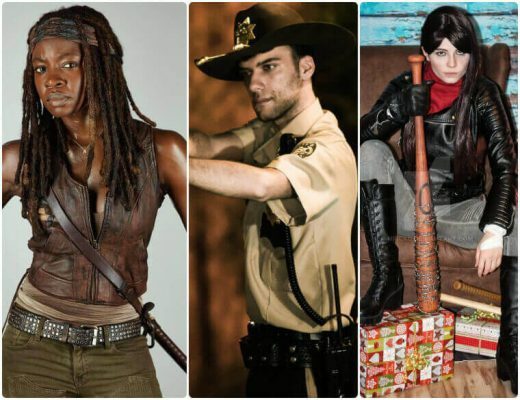 The collection also comes with a carbon prop of her Blood Sword to complete the costume. Being the last remaining survivor of her clan Mirai Kuriyama had an unfortunate childhood. The Inami family adopted her but kept her isolated because of blood manipulation abilities. The family’s middle daughter, Yui Inami, befriended her. But Mirai was later forced to kill her after a Hollow Shadow appears to possess Yui. Mirai has regretted this action ever since, and she was only able to escape the hatred of the Inami family with the help of Izumi Nase. She believes Mirai’s abilities will be of great use in the future. 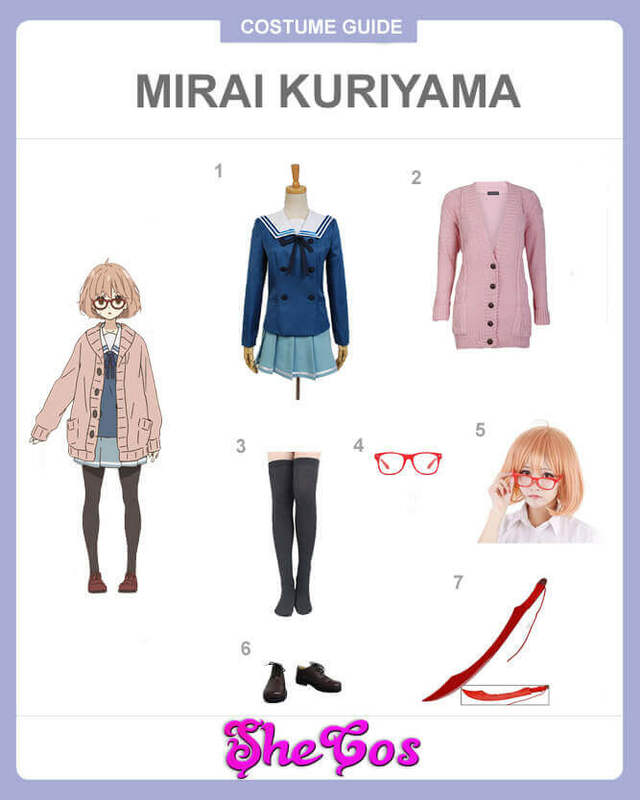 Being one of the main characters, Mirai is a popular choice for cosplayers when they’re thinking of dressing up as one of the characters of Beyond the Boundary. Despite being a clumsy and shy character, Mirai is an adorable and beautiful girl who also has combat abilities. She lacks confidence in herself to be able to fully utilize her skills, as well as her blood manipulation abilities. 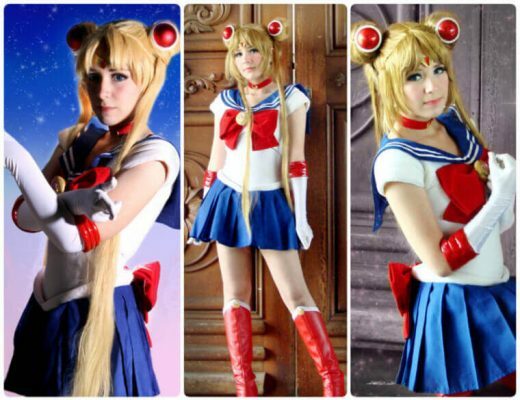 If you look at the cosplay photos, Mirai’s simple looks can’t hide her cute and beautiful appearance.